High quality multi-part stickers with a Chrome finish. 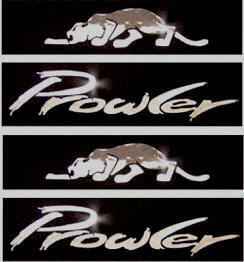 This Set consists of one Panther Kat and one Prowler word. Recommend use inside or covered area of car. Only the portion that appears white or silver in the photos to the right is the sticker. Stickers have NO background. This allows a High Quality emblem like appearance! Stickers shown mounted on black board. The Panther on top is 3 1/4 inches long. The word "Prowler" is 4 1/4 inches long. High quality multi-part stickers with a Chrome aluminum finish. 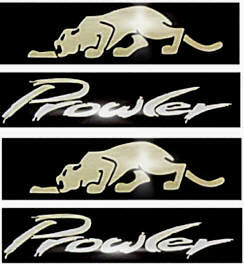 This Set consists of two Panther Kats and two Prowler words. High quality multi-part stickers with a Brushed aluminum finish. High quality multi-part stickers with a Brushed finish.